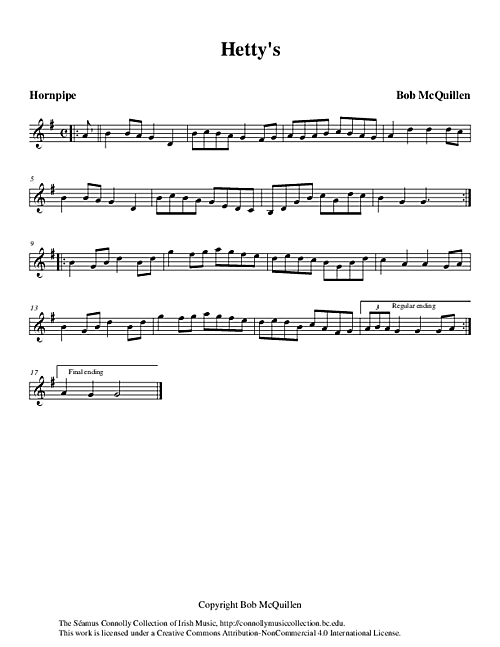 This is another of master composer Bob McQuillen's tunes. It may be found in his seventh book of compositions. It was composed for Miss Hetty Thomae from Vermont. On this track I had the honour of playing it with Bob and his band, Old New England. Bob McQuillen's Old New England et al., “Hetty's,” The Séamus Connolly Collection of Irish Music, accessed April 20, 2019, https://connollymusiccollection.bc.edu/document/432.